This website provides news, information and opinions about the co-benefits of climate policy. 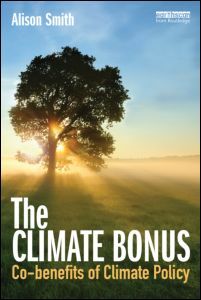 It's based on my book, The Climate Bonus: co-benefits of climate policy (Routledge, 2013). The book is very comprehensive, with over 500 references, but new information is being published all the time. This website aims to keep you up to date with news of all the latest research and policy developments. Feel free to send in suggestions for new sources to include. As well as providing general information and news about co-benefits, there is a blog where you can leave comments or questions, and suggest topics for discussion. I hope that this resource will be useful to anyone with an interest in climate policy, including the general public, students, academics, researchers, campaign groups, business people and policy makers. What are co-benefits and why do they matter? We have become bogged down in an endless debate over whether climate change is real. Many people fear that we can't afford to do anything about it, and that action to tackle climate change will destroy the economy. This website argues that in fact the opposite is true. By acting to reduce climate change, we can gain many other benefits - these are called co-benefits. For example, the main source of greenhouse gases is fossil fuels - oil, gas and coal - and these cause a lot of other problems such as air pollution, oil spills and coal mine accidents. Cutting our use of fossil fuels can give big benefits for health and the environment. Saving energy also saves money for businesses and consumers. Some of the biggest benefits are from lifestyle changes. About two thirds of all deaths are due to lack of exercise and unhealthy eating habits. The health benefits from cycling and walking instead of driving are even greater than those from cutting air pollution. Far from being an economic burden, strong action on climate can pay for itself because the cost of investing in clean, efficient, low carbon technologies is offset by the savings in health care costs, resource costs and other co-benefits. Of course it's not all good news. Some climate-friendly technologies have drawbacks, such as the waste disposal problems and accident risks of nuclear power, and the visual impacts of wind turbines. Only by looking at the big picture, including all the co-benefits and conflicts of each policy, can we maximise the benefits and minimise any problems. Even if you don't believe climate change is a problem, I hope this website will persuade you that we should be doing a lot of this climate-friendly stuff anyway, because we will end up with a cleaner, safer, healthier and more prosperous world. My name is Alison Smith and I am an environmental consultant and writer, specialising in climate, energy, transport and waste management policy. I have over 15 years' experience of analysing environmental policy for public and private sector clients, including the European Commission and the UK government. My work as a policy analyst showed me that many of our environmental problems are connected - they originate from the same sources, and can be tackled with the same tools. I hope to present a positive vision of how we can use intelligent policy design to tackle multiple environmental, social and economic problems at once, leading to a cleaner, safer and more prosperous society.